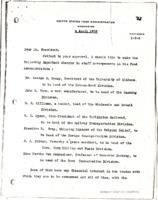 Herbert Hoover asks for Woodrow Wilson’s approval regarding several staffing changes at the Food Administration. 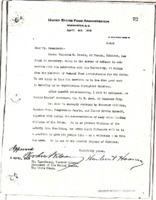 Due to Dr. Stratton D. Brooks’ resignation, Herbert Hoover nominates C.B. Ames to the position of Federal Food Administrator for Oklahoma. 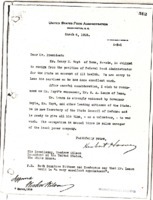 Herbert Hoover advices Woodrow Wilson to refrain from sending a reply to the telegram from Bartlett Frazier Company. In light of Henry M. Royt’s resignation, Herbert Hoover recommends H. A. Lemon for Federal Food Administrator for the state of Nevada. 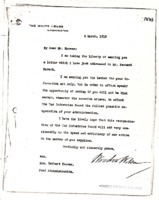 For his information, Woodrow Wilson sends Herbert Hoover a letter recently sent to Bernard Baruch. 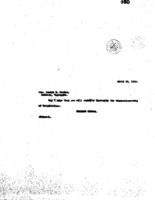 Woodrow Wilson writes to Herbert Hoover to approve his proposals. Woodrow Wilson writes to Joseph E. Davies offering him the Commissionership of Corporations.